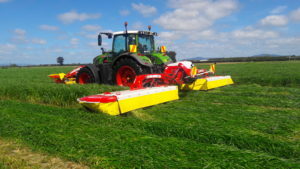 Father and son team Trevor and Daniel Lalich say one of the best features of their Pottinger A10 triple mowers is the hydraulic suspension system which can operate manually or automatically to adjust down pressure depending on the terrain. The Lalich family has a dairy farm and contracting business at Ngarua, near Morrinsville. A manager looks after the farm, which leaves Daniel and Trevor free to pursue the contracting. They do some cultivation, but most of their contracting work is harvesting grass for dairy farmers as well as a few goat farmers. Trevor says they offer a full harvesting service from cutting to raking, tedding, baling and wrapping. “A lot of farmers have their own mowers but more and more they get us in to do the whole job” he says. Along with the A10 triple mowers, they run a couple of other Pottinger machines – a Jumbo 6010L loader wagon and an eight-rotor 8.91T tedder. Pottinger’s A10 double rear butterfly mower gives a variable working width of 9.25m-10m when paired with a 3.5m front mount mower. Trevor says it is a robust, well-built machine that delivers a good cut, and despite its big working width, it is quite maneuverable. “It is an easy to lift one or both rear mowers when working in smaller paddocks” he says. The front and rear mowers overlap enough to eliminate striping when turning and the cutting width can be controlled from the cab with an ISOBUS monitor. “The monitor controls how the mowers lift at the headlands to cut right to the edge. When turning, the ISOBUS system reduces the working width of the rear mowers. This increases the overlap between the front and rear mowers so there is less striping when moving around water troughs and other obstacles” Daniel says. A center-mounted pivot on each cutter-bar gives optimum ground tracking hydraulically and it is fully adjustable to suit ground conditions. dig in. You can do it manually from the monitor or you can set it on automatic so the mower adjusts the pressure itself, depending on the conditions. We mostly leave it on the automatic setting” Daniel says. The mower features Pottinger’s exclusive ‘Y’ drive transmission gearbox. It operates at 1000RPM and is fitted with dual slip clutches on each side of the main central gearbox but not on the PTO shafts to eliminate backlash. It also has a Nonstop Lift hydraulic breakaway system which lets the mowers swing back in case of collision. At the same time the cutter-bar moves upwards on a ball joint, which allows the cutter-bar to lift over obstacles. Daniel says that if a blade should get damaged it is quick and easy to change it out for a fresh one. there are two tool boxes on the back of the mower to store tools and extra blades. While the A10 mower is an ISOBUS machine and could run off the tractors terminal, Trevor and Daniel prefer to use the Pottinger Power Control terminal because it lays out all necessary functions to operate and monitor its performance. Not only can they control the pressure on the suspension and the working width, the terminal has a hectare counter, load sensing control and headland management. It can also be programmed to automatically lift and lower the front mower with the push of a button. The display also alerts the operator when it is time to lubricate or change the oil. The Lalich family has purchased their Pottinger equipment from Piako Tractors in Morrinsville. Daniel says both Piako Tractors and Pottinger distributor Origin Agroup are really good to work with and give brilliant backup service.